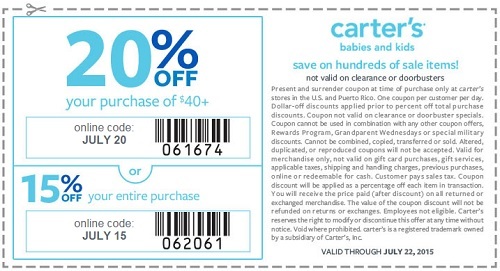 Save with sale coupon at carter's stores in the U.S. Print the coupon, show it during the time of your purchase at your nearest carter's store and save money. Take 20% off your purchase of $40 or more. Or, take 15% off your entire purchase. Source of the information is carter's. More information about the sale at stores. Offer ends 07/20/2015.